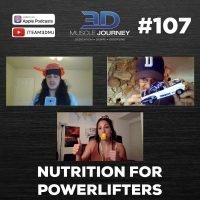 In this episode, Brad, Andrea, and Alberto discuss nutrition recommendations for powerlifters. In a sport with such high-focus on proper periodization, technique, and equipment to maximize performance, how much does nutrition matter? The coaches begin the episode by going over what they look for when evaluating a powerlifter’s application and the most common reasons powerlifters reach out for coaching. From there, they cover a variety of topics, including: the importance of competing in the appropriate weight class, long-term and short-term nutrition strategies, water cut protocols, meet day recommendations, and many more. Regardless of what stage you are in of your powerlifting career (beginner, intermediate, or advanced), this episode contains practical tips and strategies that can be applied to your situation to help you improve your performance.